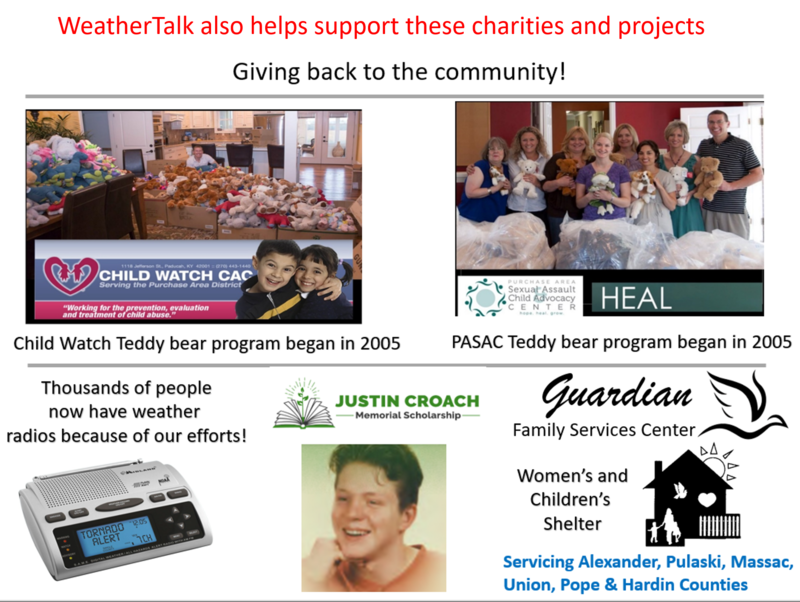 Your subscription also helps support these local charities and projects. Interactive live weather radar page. Choose the city nearest your location. If one of the city radars won’t load then try a nearby one. Click here. Forecast: Mostly sunny. Some cumulus clouds. An isolated thunderstorm possible. Most areas will remain dry. What impacts are anticipated from the weather? 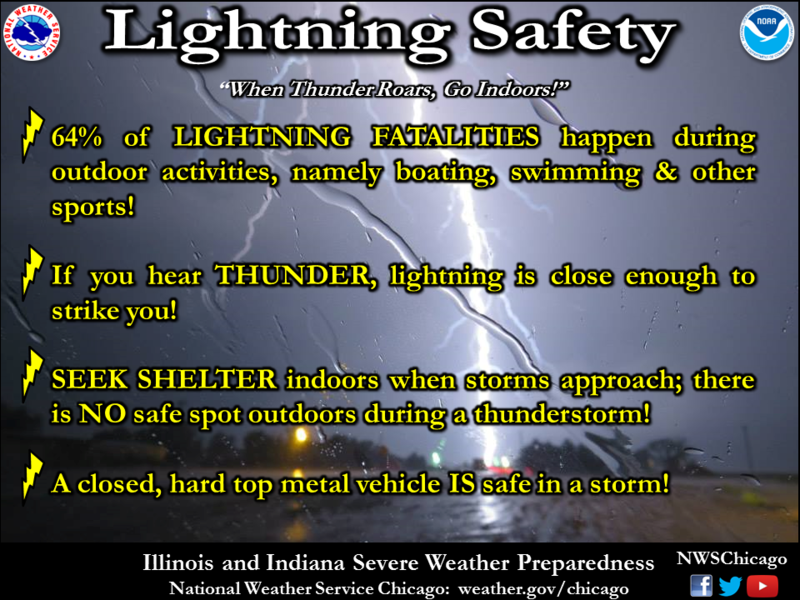 Isolated wet roadways, lightning, and gusty winds. Is severe weather expected? Typical summer isolated severe risk. Isolated downburst winds from dying storms. Forecast: Partly cloudy. Isolated showers and thunderstorms. What impacts are anticipated from the weather? Isolated wet roadways. Lightning. Where summer storms occur you can have locally heavy downpours, small hail, and strong winds. Forecast: Partly sunny. A chance of strong thunderstorms. Hot and muggy. What impacts are anticipated from the weather? Wet roadways. Lightning. High winds possible near storms. Nickel size hail. Is severe weather expected? A few severe thunderstorms are possible. Monitor updates. Should I cancel my outdoor plans? Monitor updates and radars. Forecast: Partly cloudy. Scattered strong thunderstorms. Warm. Humid. Is severe weather expected? I can’t rule out severe thunderstorms. Monitor updates, especially early in the night. Forecast: Partly sunny. A chance of scattered thunderstorms. What impacts are anticipated from the weather? Scattered wet roadways. Lightning. Where summer storms occur you can have locally heavy downpours, small hail, and strong winds. Forecast: Partly cloudy. Warm. Humid. Forecast: Partly sunny. A chance of widely scattered thunderstorms. Hot and muggy. What impacts are anticipated from the weather? Widely scattered wet roadways. Lightning. Where summer storms occur you can have locally heavy downpours, small hail, and strong winds. Forecast: Partly cloudy. Isolated showers and thunderstorms. Warm. Humid. Scattered thunderstorms are possible into next week. Scattered thunderstorms, this time of the year, can always produce much heavier rain totals. Questions remain on the potential track of several thunderstorm complexes later this week. Here is the latest WPC / NOAA rainfall forecast. This is broad brushed. It is possible that some areas remain mostly dry. We are in a summer pattern. That means a WIDE range of rainfall totals (even within the same county). This graphic will not cover those wild swings in rainfall totals that occur from locally heavy thunderstorms. For some locations, these numbers are way too low. 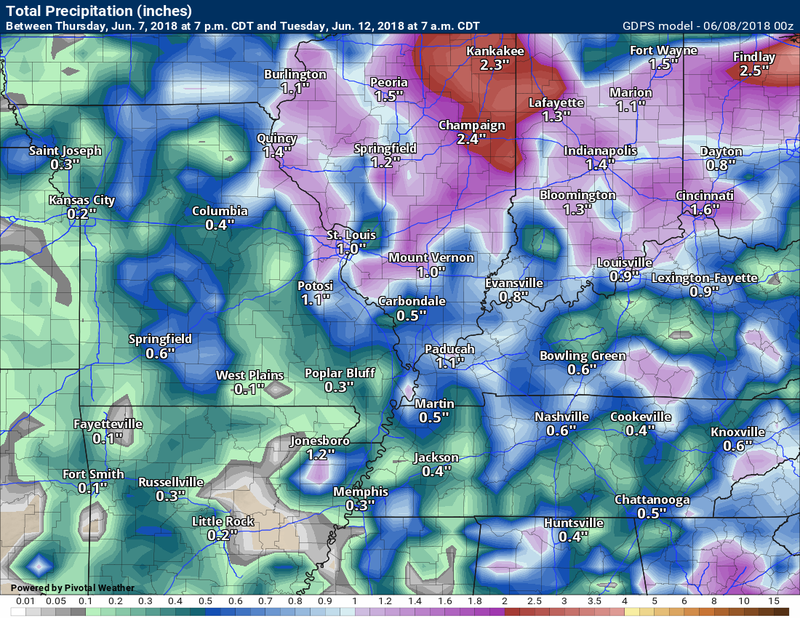 This next graphic is the NAM model guidance rainfall forecast through Monday 1 PM. Notice the differences in each of the models. 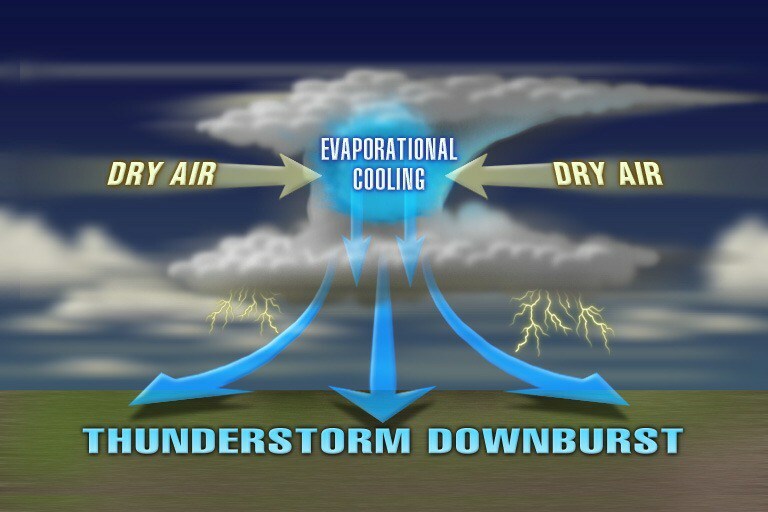 The differences center around thunderstorm complexes that commonly form during the summer months. These complexes are tricky, at best, to forecast more than 12 to 24 hours in advance. 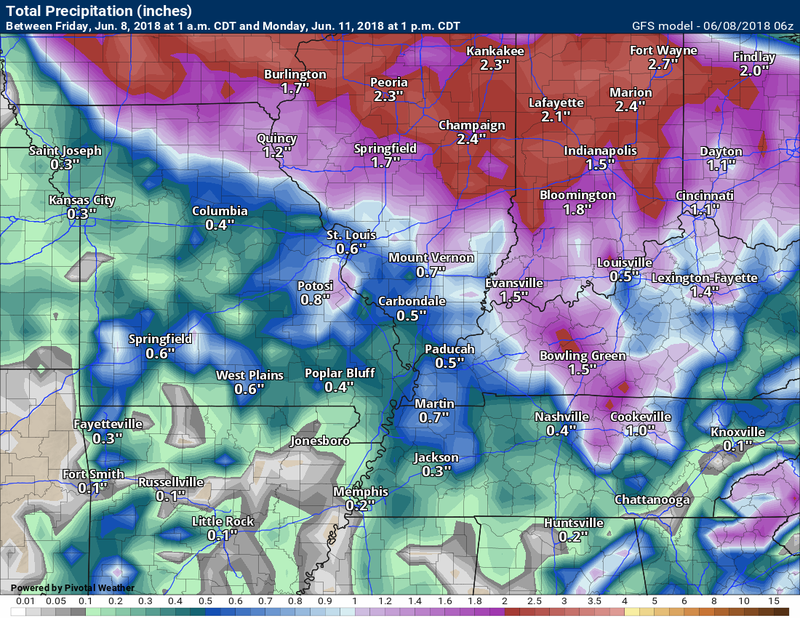 Rainfall totals can vary greatly within the complexes. We offer interactive local city live radars and regional radars. If a radar does not update then try another one. If a radar does not appear to be refreshing then hit Ctrl F5 on your keyboard. You may also try restarting your browser. Friday through Friday night: Isolated thunderstorms are possible Friday. 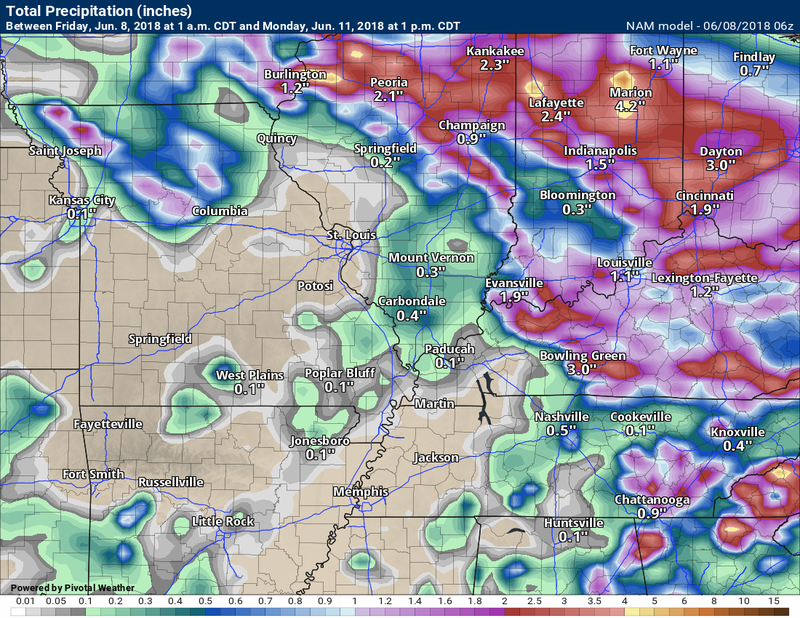 Scattered storms are possible Friday night, especially over southeast Missouri and southern Illinois. Confidence in storm coverage further south is lower. Monitor updates. Keep in mind, it is possible many areas remain dry. If we can pull off an organized MCS (storm complex) or line of storms then more people will receive some rain. Some of the storms will produce heavy downpours, frequent lightning, small hail, and gusty winds. I can’t rule out isolated severe weather, but organized severe weather appears unlikely. Saturday into Sunday night: Scattered storms again possible. A few storms could produce heavy rain, gusty winds, small hail, and frequent lightning. I can’t rule out isolated severe thunderstorms. Monitor updates. Monday night through next Friday: Scattered summer-type thunderstorms will be possible. Where storms occur there will be heavy rain, gusty winds, small hail, and frequent cloud to ground lightning. At this time, organized severe weather appears unlikely. Monitor updates. Isolated severe weather risk. The spring and preliminary summer outlooks have been posted for subscribers. Scroll down to see the outlook.Not a subscriber? Learn more at this link. Scattered showers and locally heavy thunderstorms. No significant changes in the going forecast. The pattern will continue into next week. Perhaps most of the week. Portions of the area do need rain. 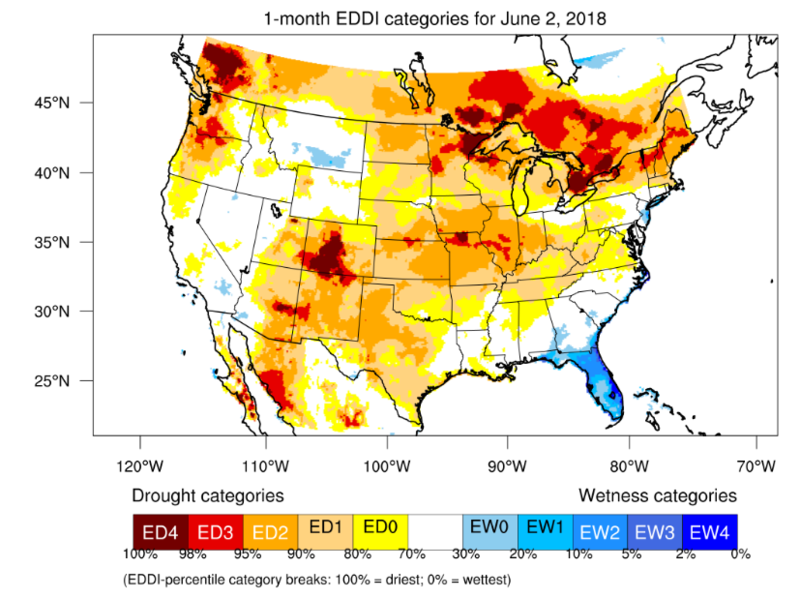 The Evaporative Demand Drought Index (EDDI) is an experimental tool that can serve as an indicator of both rapidly evolving “flash” droughts (developing over a few weeks) and sustained droughts. 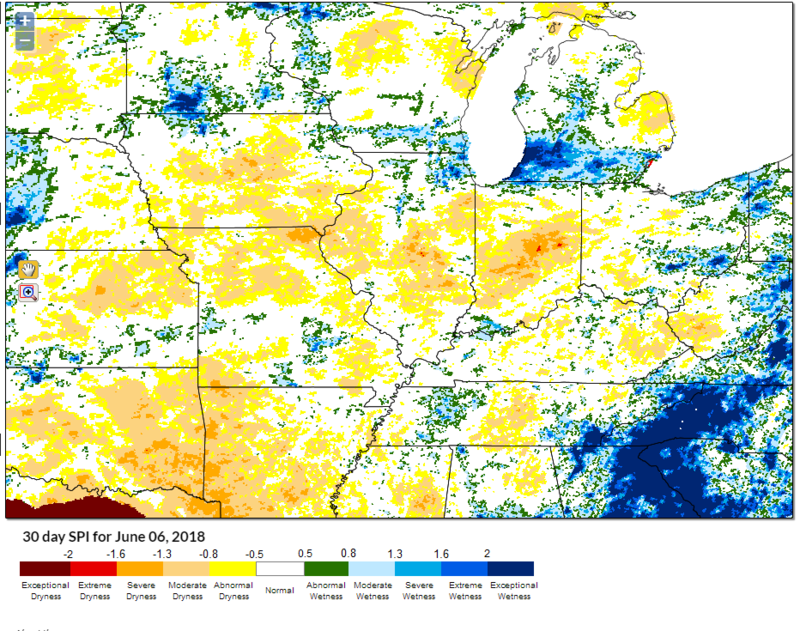 You can see a large portion of the corn belt is in need of rain (not everyone). 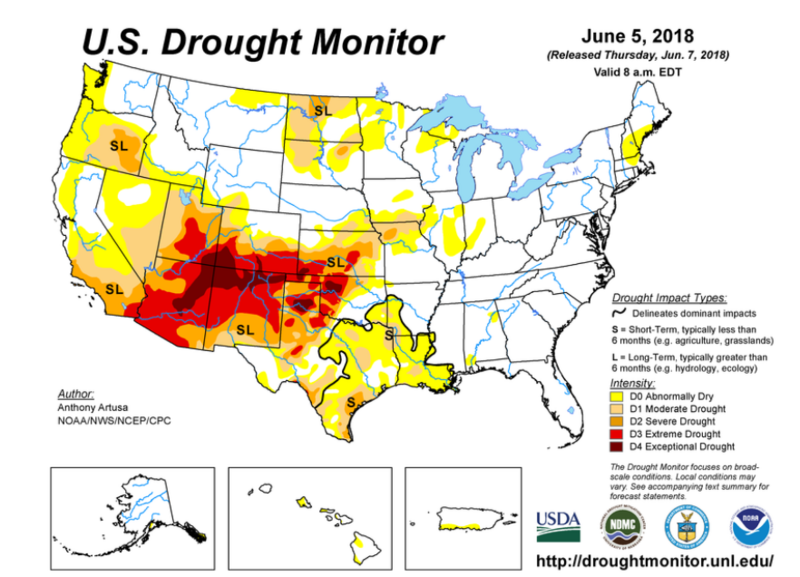 The latest drought monitor index shows our region is not in drought. Areas to the north are. I like to use the SPI index to find areas of dry soil. You can see sporadic to numerous areas of dryness in and near our region. There will likely be adjustments in the % chance of thunderstorms. Monitor updates if you have outdoor plans (monitor radars). A rather typical summer pattern is establishing itself across our region. 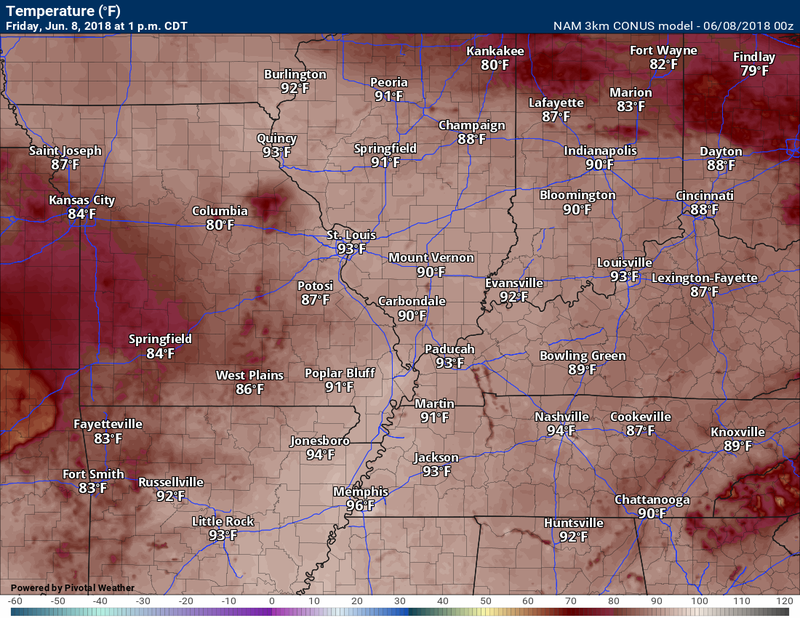 You can expect daily high temperatures in the upper 80’s to lower 90’s. Overnight lows near 70 degrees. This weather will last well into next week. Dew points will make it feel sticky outside. 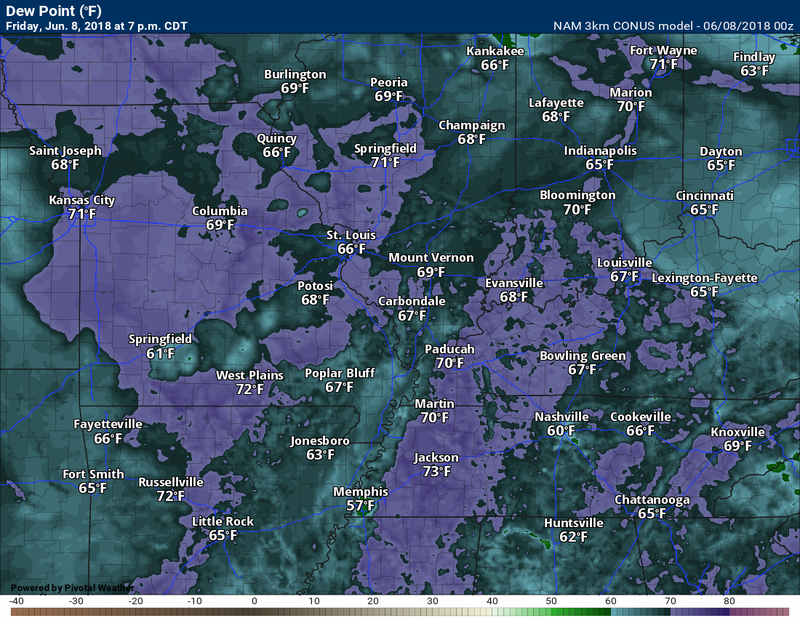 Dew points are a measure of moisture in the air. The higher the dew point the stickier it feels. We will have daily thunderstorm chances. The greatest coverage will be during the afternoon hours. Heat of the day thunderstorms. We will have some weak disturbances that will push through the region over the weekend. Each of these could produce a bit more coverage in precipitation. Confidence in timing, however, is rather low. Model guidance is of little use in this type of pattern. Occasionally, we may have thunderstorm complexes form. These complexes are called MCS’s. MCS’s can produce greater rain coverage and intensity. I will be monitoring for these. The Storm Prediction Center is also watching for the potential of MCS’s. They have outlined our area in a marginal (level one out of five) risk both Saturday and Sunday. That just means a couple of storms could become severe. Here is the NAM 3K future-cast radar. Notice how it centers on late Saturday night into Sunday morning for a complex of storms moving in from the northwest. For now, don’t cancel any weekend plans. Monitor radars. A few storms will likely dot radar over the coming days. Storms that form will produce torrential downpours, frequent cloud to ground lightning, gusty winds, and even small hail. Typical summer storms. I can’t rule out isolated downburst winds, as well. Downburst winds can exceed 50 mph. 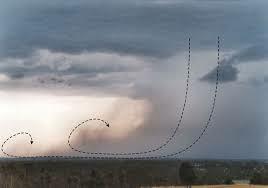 From a distance, downburst winds may look like this. This is called a rain foot. It can contain high winds. Storms over the coming days will likely be prolific lightning producers. 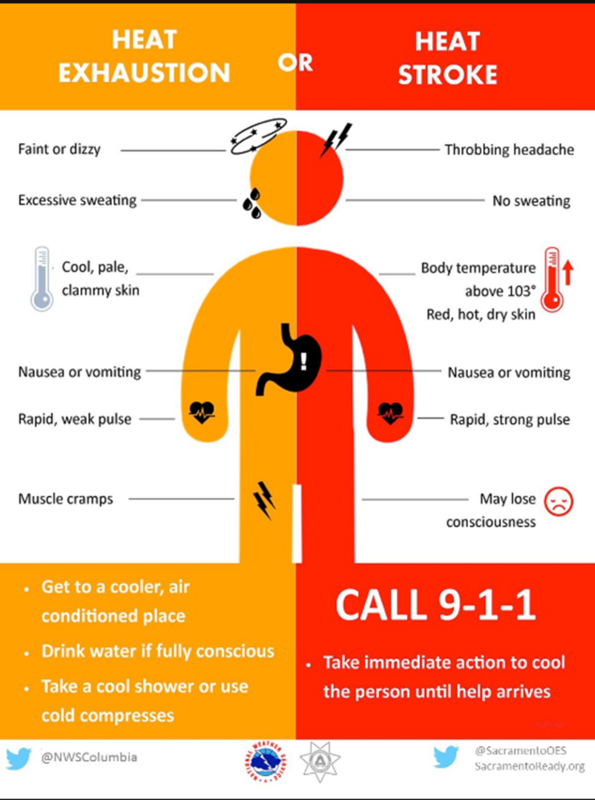 Do you know the symptoms of heat related illness? 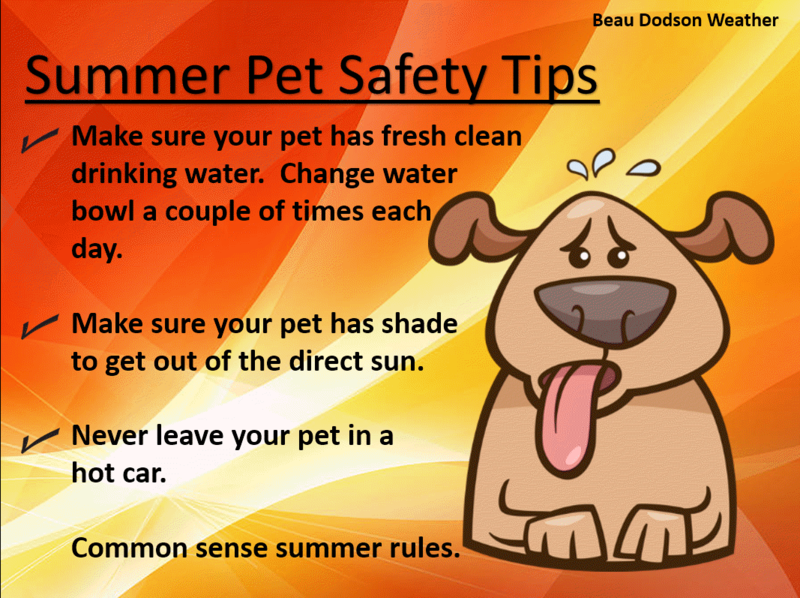 Also, don’t forget our outdoor friends. Only subscribers can see this graphic. I bring these to you from the BAMwx team. I pay them to help with videos. They have a great team of meteorologists. The Ohio and Missouri Valley videos cover most of our area. They do not have a specific Tennessee Valley forecast but may add one in the future. NOTE: THESE ARE USUALLY NOT UPDATED ON SATURDAY OR SUNDAY. 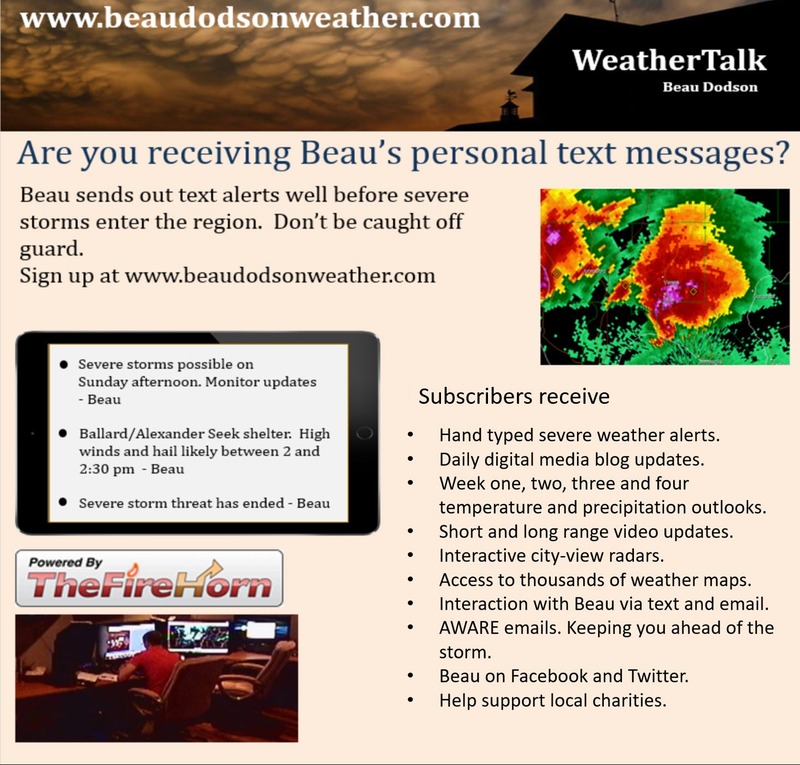 We couldn’t get Google Hangouts to function for our guest this week, so this week’s WeatherBrains is a discussion amongst the regulars about what is on their minds. 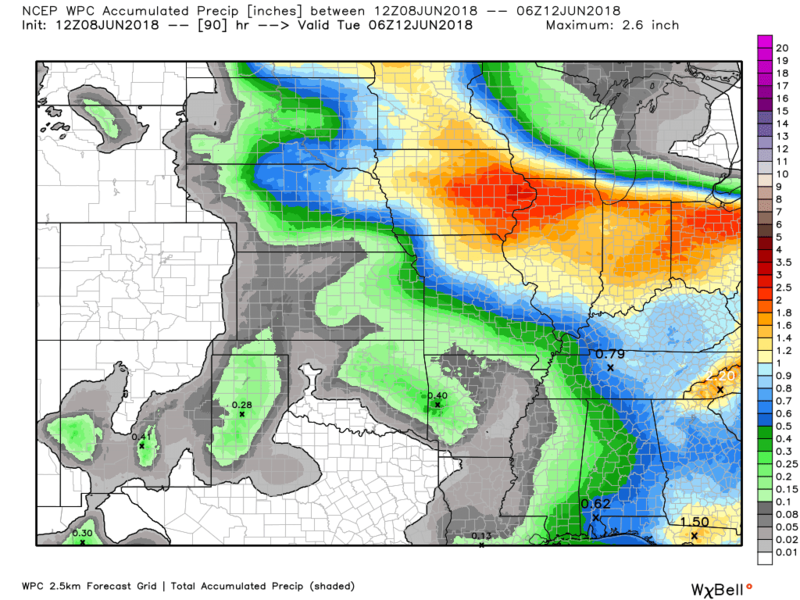 June 8, 2018: Scattered storms this weekend. Warm and muggy. June 11, 2018: Warm weather to continue. Some thunderstorm chances.